At North Brisbane Trees, we pride ourselves on providing only the best quality firewood to all of Brisbane and surrounding districts all year round. If you’ve been looking for the best firewood for sale in Brisbane, you’ve come to the right spot. Is your firewood ready to burn now? Absolutely! Unlike many of our competitors, our firewood is split and then left to season for no less than 18 months before we sell it. If you can’t get our firewood to burn, then its back to Scouts or Girl Guides for you! What kind of wood is your firewood? North Brisbane Trees only use HARDWOOD varieties such as Ironbark, Bluegum, Tallowwood, Spotted Gum, etc. We know many of our competitors will mix inferior softwood into their firewood. Softwoods such as Pine will of course burn, however, you don’t get nearly as much heat from softwoods and only a fraction of the burn time when compared to hardwoods. How do you source your wood? North Brisbane Trees recycles everything collected through the course of our Tree Removal and Tree Trimming services. The softwoods and smaller diameter hardwood we turn into a quality AGED Forest Mulch while the valuable larger diameter hardwoods are used for firewood sales. Do you currently have any seasoned firewood for sale? 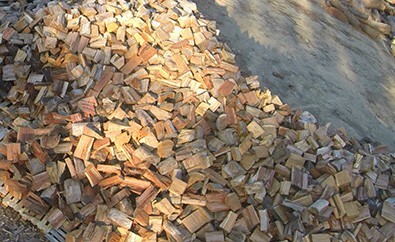 We have seasoned hardwood firewood ready for pick-up or delivery. How do you deliver the wood and how soon can you get it to me? We have a small and very maneuverable tipping truck which holds 2m3 and a larger tipping trailer which holds 6m3 for bulk deliveries. We deliver 7 days a week and usually only need 1 or 2 days’ notice. How much is your firewood? Pick-up is now available from our yard in Yugar, 4520. Please note: that this Firewood is loosely stacked in 1m3 bins and will contain some bark. I’d like to order some of your firewood, what now? Great, you won’t be disappointed with our product or our service! Please either fill out the Contact Us form to the right and we will get back to you within 24 hours or just give us a ring on (07) 3289 3610 to ask about our firewood sales in Brisbane. Our firewood can be used all year round and we know it’s the best firewood Brisbane has to offer! It’s not free firewood but the quality of our firewood is second to none and worth paying for, especially at these affordable prices. That’s the North Brisbane Trees difference! 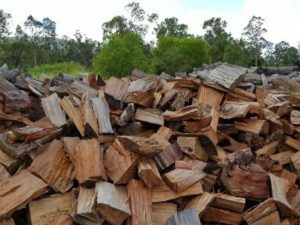 Fill out the Contact Us form to the right and we will get back to you within 24 hours or just give us a ring on (07) 3289 3610 to ask about our firewood sales in Brisbane. And remember you can also talk to us about tree removal and tree pruning. North Brisbane Trees are experts in tree removal, based out of Samford in Brisbane North. We promise a reliable, prompt, professional, expert & affordable tree service – every time!